In the same year, my Jenny, the baby of the family, graduated from high school and my husband turned 60. The other two kids were in college and busy with their own lives, so to celebrate we planned a hiking vacation to Utah just the three of us. 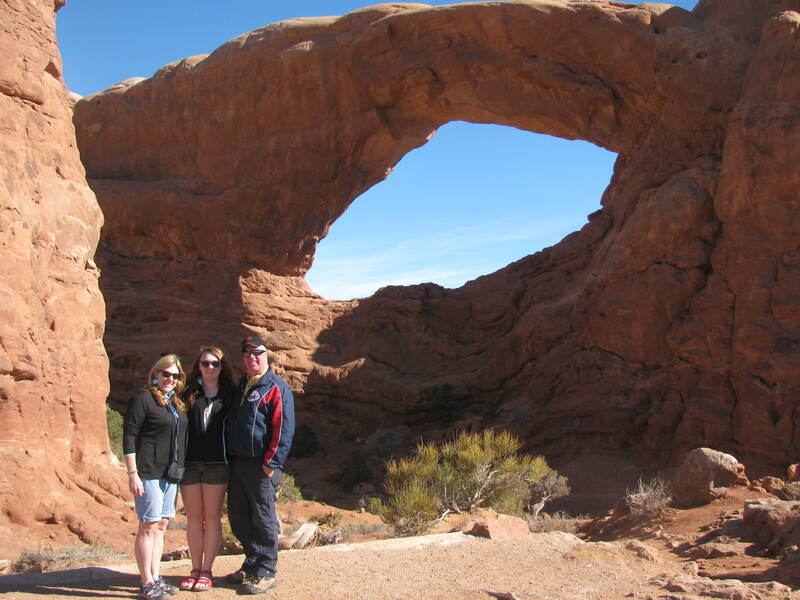 We flew to Las Vegas, rented a big jeep, and off we went into the desert to drive and hike in the Grand Circle of Utah. The Grand Circle has many National and State parks and the sites are breathtaking. Jenny had decided to study archeology in college, and so some of our stops and hikes involved finding and photographing ancient rock art. 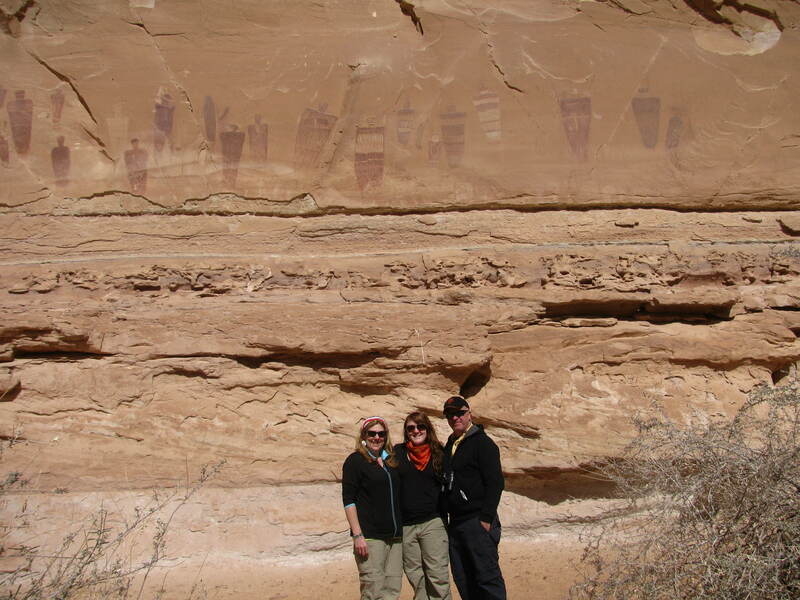 One of our adventures involved hiking 13 miles down into Horseshoe Canyon to see the Great Gallery. The Great Gallery is part of Canyonlands National park, and is so remote and difficult to get to that it gets very few visitors, but those who come are drawn to see the world renown rock art. The hike was not as difficult as it sounds. We had our hiking boots and adventure pants on. They claim to have a lot of rattle snakes in the canyon, but we never saw any. We had our food, snacks, and water along. As we made our way down into the canyon, and along the canyon stream toward our destination, we talked about the past cultures which had lived in the canyon and the stories we had read about the people who made the rock art. Our expectation was to see something great. The long trek to get there added to the mystery and sacredness of it all, and the Great Gallery did not disappoint. It was spectacular. 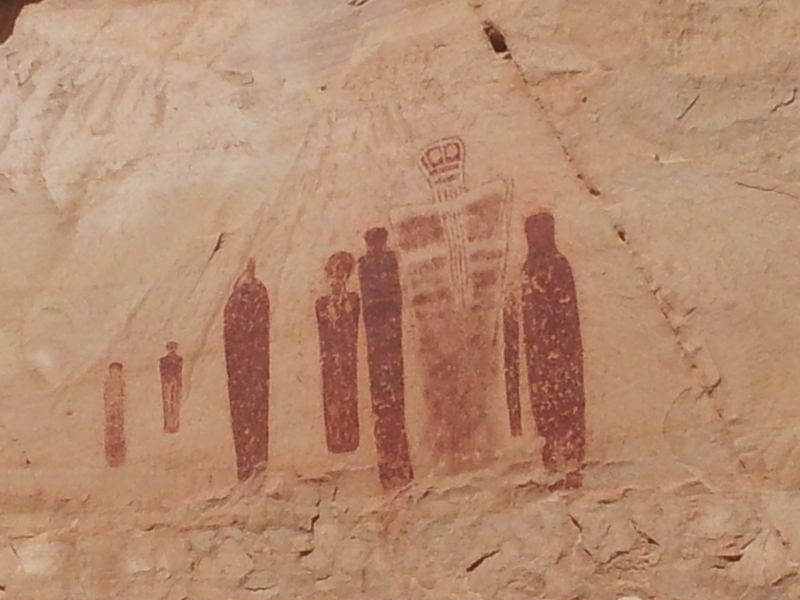 We were initially speechless, as the three of us stood in front of the red rock wall, with the six foot high painted figures, dating back 2000 to 5000 years ago. They were larger then I had imagined and each of us scanned over the multiple figures of people, animals, mysterious symbols and etchings left by those who were in the valley long before us. It took us a while to express in words our thoughts and feelings as we stood there, but we all agreed that we were viewing something very special. This was something bigger then ourselves and something to remind us that we are but a small thing in a big universe. We have traveled a lot, but this was one of the most interesting and moving sites we have ever seen. It almost felt spiritual in the sense that these ancient tribes made and displayed this art thousands of years ago in potentially religious or cultural ceremonies, and yet even though they were long gone, we could witness and feel a little of what they felt in expressing themselves in this harsh and yet beautiful land, as they strived to survive and thrive with their families. It was a good reminder for Joe and me to appreciate the beautiful and mysterious things that life still holds for us, and it was good for Jenny to see the possibilities of the future for her in this amazing profession of Archeology. These experiences bring us closer and yet show us how big the world can be for us if we are open to new adventures.